Hello everyone! I am writing from my campsite in Maple Canyon, a climbing destination in Utah. Today is day five of the USA road trip that Tom and I have been planning for months. So far it has been a blast, and I wanted to recount a little bit of our adventures on this blog, as not only is this blog about sharing food, but also about sharing adventures. And, so far, this has been quite an adventure! Day 1, Tom and I left Canmore, Alberta and drove south to a campsite just outside of Anaconda, Montana. We slept in our car that night for simplicity sake, and packed up early the next day to head out to Ogden, Utah. 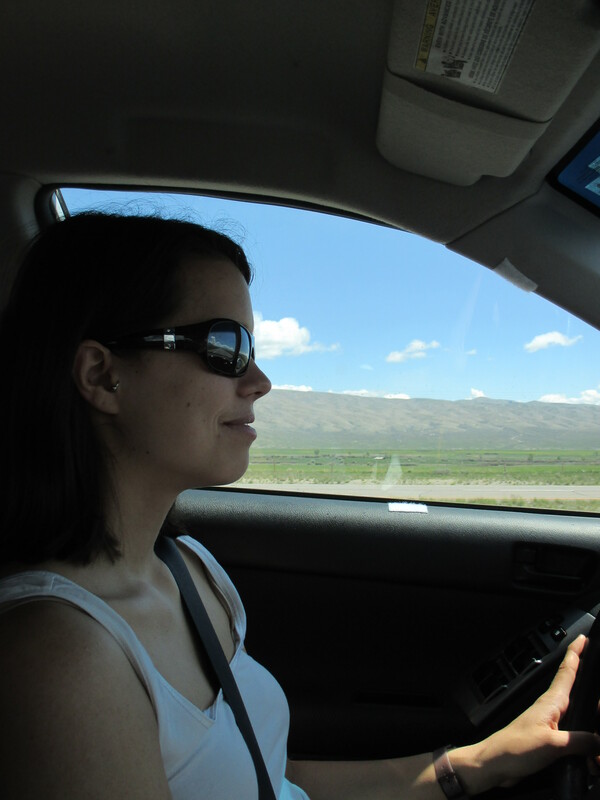 The drive was incredible, as the scenery changed from close-up jagged cliffs in Montana, to straight road, fields of potatoes and cows in Idaho with mountains in the very far distance. It felt like the view was just getting better and better as we drove into Utah, with rolling red cliffs in the distance, and huge snowy peaks in the far distance. We camped just outside of Ogden on day 2 and drove through Salt Lake City on day 3. We stopped at some sport shops, a brewery called Epic Brewery, and a vegan diner called Vertical Diner. At the diner Tom had a bean and seitan burrito and I had a Philly cheese steak sandwich made with tempeh and nutritional yeast cheese sauce. The menu was delightful, and I highly recommend it to anyone. And, Epic was pretty great too. Salt Lake City has a law that beer must be no more than 4% at restaurants, grocery stores, and on tap at bars, but at breweries it can be more, only in single bottle sales. We bought five bottles, one of which was a sage beer. Tom opened it after I had eaten a cookie (s’more Oreo, mmmmm), so I didn’t care for that beer much. Had I drank it with tofurkey or something savoury, I may have enjoyed it more hehe. Day 3 also involved driving to Grand Junction, Colorado, where we saw Shakey Graves, a musician that Tom and I have gotten into over the past year. He performed for free at an outdoor street festival in Grand Junction. Tom and I enjoyed vegetarian paninis at Café Sol, and dairy-free gelato from a local vender before the performance. We got lost on the way to the campsite that night, which was in the middle of the desert. I think both of us were a little apprehensive, as we saw cars in the distance, who were driving in the opposite direction. Finally, we found the site, which was supposed to be free, but was asking for $10. We paid it, only to find that the site was full. A nice couple, who were also sleeping in their vehicle, let us share their sit, which easily accommodated two parties. I had the best sleep that night, after having woken up from being cold the previous two nights. Anaconda and Ogden must have gone down to between 5-10*C at night, and the dessert felt warmer. While the days go up to between 25-30*C, nights get chilly. Day 4, we drove to Maple Canyon and climbed a few routes in the late afternoon. This place is incredible, like no other climbing place I have ever been. The cobblestone rock appears bubble-like, and gives a plethora of holds, which can be daunting, as they are not always as juggy as they appear. As I sit here in my campsite, sipping on coffee, bundled in my puffy winter jacket, I am surrounded by humungous cliffs that peak in bulges and towers, like the top of a castle tower. We are so close to the cliffs that we can return to our campsite for lunch, which is unique, compared to the typical 20-30 minute approach trail. I am feeling fortunate, happy, and excited to continue on this adventure. Here is a recipe of overnight oats that fuels us before a full day, inspired by a recipe from ohsheglows.com. It serves two, though I often have trouble finishing my serving. Tom usually helps me out, or I save it for a snack. The night before I want to eat this breakfast, I mix together the first six ingredients in a mason jar with a lid. The amount of milk depends on how liquid you like your oats the next day, but it should appear liquidy because the oats soak up the milk. Since the temperature here goes down so low, I just leave the oats out by our tent overnight, but at home I would put them in the fridge. The next day, I serve the oats with the optional toppings listed above. This morning I omitted the maple syrup, as I have found the oats sweet enough without. I am eating these oats as I type this! It is definitely worth trying, as cold oats are waaaay better than they sound. I’d love to come back to Halifax! Especially to see you and the gang. Great memories from last years road trip.